You don’t have to spend a fortune to get a massive screen in your home theater. While the top of the line projectors can cost over a grand, you can also find perfectly acceptable models that are kinder on your budget. The best cheap projector under 100 dollars won’t give you extra features like 3D or 4K resolution, they are the most affordable way to have a big screen under your own roof. Most projectors in this price point will use an LED bulb for the image. This style of lamp has both advantages and disadvantages compared to traditional halogen bulbs. One big difference is they generate less heat, which means the projectors can be smaller and lighter, as well as more affordable. They also tend to be less bright, so you’ll probably need to make more adjustments to your space than you would with a more expensive projector. Considering the difference in price, though, this is a small concession in our estimation. We’ve picked out a few of our favorite projectors under a hundred bucks. Read on below for the full reviews, and some info on what to expect when you buy a cheap projector. The Dr. J Mini Projector uses an LED bulb to light its lamp. This gives it a low energy usage and long lamp life. The downside is that it’s not as bright, putting out only 50 ANSI lumens. It is a bit brighter than the LED projectors of the past, but you’ll still need to use it in a dark environment to get a clear picture. The resolution is pretty good for the price. It has a native resolution of 480p, though it does support content in 1080p. The contrast ratio is 2,000:1 and the color accuracy is pretty good. We wouldn’t recommend it for anything you need to see clearly, like documents in a business presentation, but for watching shows and movies it’ll serve you well enough. In terms of usability, sending your content to the projector is as simple as plugging your streaming stick, game console, or other device into the HDMI port. This isn’t a short-throw projector per se but it does have a shorter throw than other options. You’ll still need a decent amount of space—up to 11 feet if you want the maximum screen size—but it’s easier to work with in smaller spaces. Once you have this projector in position, it’s easy to adjust the picture and get to watching. If you want a cheap projector you can take on the go, this is a great choice for you. This model still uses LED technology for the bulb, so it’s not the brightest projector out there. It does at least give you 2,600 lumens, relatively high compared to other options in the under $100 category. You’ll still need to control the ambient light to get the best picture, but you won’t need to limit yourself to completely dark rooms. We were pretty impressed by the picture overall. It supports a resolution of 1080p and has a contrast ratio of 2,000:1. We also didn’t experience much picture lag, which would make this projector useful for gaming as well as watching. The only potential problem we saw with this projector was the throw length. From ten feet away you’ll get a picture that’s about 120”—much bigger than the average TV, for sure, but you’ll need about 16 feet to get the screen to its maximum size. If you have a small space, this might not be the projector for you. Otherwise, we found the set-up intuitive and the picture’s pretty good for the price. It even comes with speakers built right in, giving you everything you need to start watching in one convenient package. The ideal distance for this projector is about six to eight feet from the screen, an easy distance to achieve in most homes. This will give you a large screen, but not a super-sized one. You’ll need about twice that space to get the full 176” the projector is capable of. DBPower claims this projector is 50% brighter than other LED projectors thanks to their six-stage lens technology. The extra lenses did noticeably sharpen the picture, and the resolution of the image is great for the price. It’s a bit dim for our tastes, though—you’ll definitely need to turn out all the lights before you try watching something with this projector. The portability of this projector is its most noteworthy feature. It weighs just over two pounds and is about the length of your hand. That’s especially impressive considering the unit also features built-in speakers. They’re not the highest audio quality but they put out a lot more volume than the speakers on most budget projectors. That makes this little guy perfect for RVs or backyard movie nights. If you’re looking for convenience, the DBPower Mini Projector is a great choice. You can take it anywhere. Using it is as simple as hanging up the screen and plugging your content into the HDMI input, and it’s built to last for years inside and out. The brightness may be an issue for some users, but if you only plan to watch the projector in dark spaces it’s definitely worth considering. The lamp in this projector puts out 2,200 lumens and is definitely brighter than we expect for the price. We wouldn’t recommend using it in bright sunlight, but the picture is visible even with low-level ambient light. This little unit feels a bit sturdier than other mini projectors, too. The fan runs almost silently, but it’s clearly doing its job, keeping the unit cool even after hours of use. Considering the long life of LED bulbs, it’s possible you won’t have to do any maintenance on the projector the entire time you own it. The GP16 has more input options than most of the projectors we looked at. It has the standard HDMI input but also gives you two USB ports, a VGA input, and a microSD slot. This also makes it a bit more complicated to operate—not prohibitively difficult, but not your best choice if you’re looking for a simple plug-and-play set-up. This is a solid, well-made projector. It’s versatile, thanks to the added inputs and brighter lamp, and the picture exceeded our expectations given the price. In our opinion, this is a great value for any home theater. The stats on this projector are comparable to the other options we’ve reviewed. It has a contrast ratio of about 2,000:1 and can support 1080p resolution. 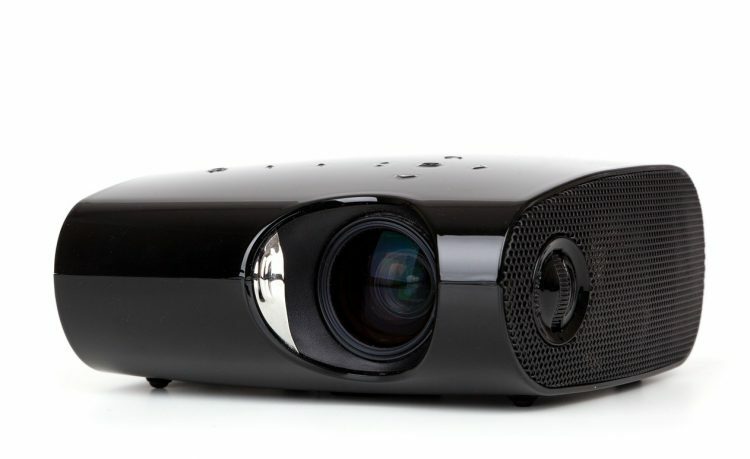 (>>> Related Guide about affordable 1080p Projectors up to $500) The lamp puts out about 1,800 lumens, so you will need to turn out the lights if you want to see the picture clearly. The design of this projector is honestly better than we expected given the price. You can input content through USB or VGA as well as HDMI, which will be helpful for integrating it into more complex home theater systems. It’s also a nice portable option, with a compact casing that’s among the smallest on the list. The on-board speakers give about as much volume as the ones you’ll find on a laptop—fine for private viewing in a smaller space. There’s an audio jack if you want to connect external speakers for more volume. It also has a headphone jack, which is a handy extra feature. We also like that this projector is user-friendly. There’s a vertical keystone correction to help calibrate the image. It also has a relatively short throw ratio, with an ideal projection distance of around six feet that makes it a good choice for smaller spaces. As budget projectors go, this is one model that outperforms its price point. When it comes to the projector itself, we had a few complaints. It’s a bit tricky getting the picture into focus, and the adjustment on the projector isn’t easy to access or use. Once you get it focused, the picture is fine up to about 100 inches or so of screen size. Beyond that, the brightness and sharpness of the image drop noticeably. The ideal distance for this projector seems to be about six feet from the screen. This gives you a clear 70-inch picture—not the largest screen, but a good size for indoor home theater use. At this size, the image quality is pretty good, though you’ll likely want to fiddle with the image controls a bit after the initial set-up. It’s also a lot simpler to connect this projector to your content source than it is to adjust the image. It’s easy to hook it up to a smartphone or tablet with an HDMI adapter, and it has the full array of common inputs, including an SD port. This definitely isn’t the most user-friendly option on the list. Even so, the picture quality and included accessories make it a good value, and it’s an especially appealing choice for smaller indoor home theaters. While the picture quality is consistent, it’s not the best in the price range. It has a lower contrast ratio than even most budget projectors. The square pixel system keeps the picture from looking jagged or blurry, for the most part, but the color saturation isn’t as high and images aren’t quite as sharp overall. It’s a shame that the image isn’t quite as good, because the engineering of this projector is pretty solid. The cooling system is practically silent and very effective. It’s also decently bright for an LED projector. You’ll want a fairly dim environment for the best viewing experience, but you won’t need to turn off every lamp in the house just to see it. The low lag time on this projector does make it a great option for gamers looking for a big screen on a budget. (>>> Related Guide: The Best Projector for Golf Simulator Users) The only other thing we weren’t impressed by on this were the speakers—you’ll probably want to use an external sound source. You can get a better image quality for the price, but if you’re looking to get the biggest image for your money this Crenova is a good way to go. The easy set-up and operation are also a plus, and it’s built solidly enough you won’t need to worry about maintenance. The clarity of the image is pretty good on this unit, with no blurring or pixelation in the image. The lamp is slightly less durable than in other models on the list, but it still has a lifespan of up to 30,000 hours, long enough you’ll probably never need to replace it. It’s also relatively bright and can cope with some ambient light, though the picture will be best in a dark room. The recommended optimum distance between projector and screen is between six and eight feet. At this distance, you’ll get a screen size of around 80 to 90 inches, which is plenty large enough for a lot of home theaters. If you want to get bigger, you can—up to 170” at sixteen feet. It’s fairly easy to focus in and adjust the image with the keystone correction, either on the device itself or using the included remote. You’ll want to use external speakers with this projector because the ones that come on it are pretty weak and they don’t support Dolby audio. Aside from that, though, we have very few complaints about this projector. The quality is high for the price, and the intuitive design can be a good fit in any home. As we hinted at in the introduction, you will have to make a few concessions when you’re looking for a projector in this price range. The biggest question you’ll have to answer is how bright you need the lamp to be. Many of the options on this list need a completely dark environment to function. A dark space isn’t a problem for some customers. If you’re using the projector for backyard night-time movie nights, for example, or if you like watching movies in a theater-like environment, you won’t need to worry so much about the brightness. If you’d rather have some lights on in the room while you’re watching, though, you’ll probably want to get one of the brighter lamps. None of these projectors will be perfectly visible in sunlight, and most of them will struggle in a well-lit room, but some will handle small amounts of ambient light better than others. The overall image quality is also going to be a bit weaker with these projectors than what you’d find on a higher-end model. The contrast ratio is generally on the low side, between 1,000:1 and 3,000:1 depending on the model. In practical terms, this means the blacks won’t be as deep and the colors aren’t going to be as vibrant. The main factor in the image quality, though, is the native resolution. This is the resolution of the projector itself—in other words, how many pixels are represented in each dimension on the screen. This is different than the supported resolution or maximum resolution, which is the highest content resolution the projector can accept and convert for display. All of these projectors can support content up to 1080p resolution—pretty much any content short of 4K UltraHD (>>> Related Guide: Best 4K Projector Under 2000). None of them have a native resolution that high, however, so the image will be less sharp than if you were to project it on a higher-end model. Whether or not this is an issue for you really depends on what kind of content you want to view. The issue of resolution is one you’ll especially want to think about if you plan to use the projector for modern gaming. It’s also the main thing that makes these projectors less ideal for workplace presentations and other uses where you’ll need to read words on the screen. If you’re just watching movies and TV shows, though, the lower resolution on these projectors likely won’t prove an issue. If you’re looking to set up your projector the cheapest way possible, you don’t need to buy a screen. There are plenty of DIY solutions. You can use a bedsheet or a set of flat curtains, for example. Monochromatic colors tend to work best. White will have the least impact on the image, but shades of gray can be a good choice to give you more contrast. You can even shine the projected image directly on the wall if the layout of your home offers a smooth patch that’s large enough. While you don’t necessarily need to buy a screen, using one can have advantages, especially when you’re using a cheaper projector. It can help you to get the clearest, brightest image possible, making the best of a less than stellar lamp. Screens vary in price from around thirty bucks to a few hundred, but just like with projectors you don’t have to spend a fortune to get something good. A high-contrast screen can be a great option if you’re working with an LED projector. These screens are designed to enhance the projected image, giving you a clearer picture than you’d get from even a standard white screen. Some of these can get pretty costly, but you can find models like the Artlii 100-inch projector screen for about $40. Pick the right projector and you can still buy the entire set-up for right around a hundred dollars. Hopefully, by now you have a better idea of what’s out there in the world of projectors for less than $100—and what you should expect when you buy one of these models. One great thing about LED projectors is that they’re not only cheaper up-front but also in the long-term. The extremely long lamp lifespan means you’ll likely never have to replace it, good news for your budget considering how expensive replacement projector bulbs can be. Within the category of cheap projectors, the right choice for your home really depends on your space and expected use. You can save yourself some frustration by taking measurements of your viewing space before you start shopping. This will give you a better idea of how much throw distance you have to work with and how large of a screen you want to use. With so many affordable projectors to choose from, you’re bound to find something that’s perfect for your needs on the list above. We hope this article has answered all your questions about cheap projectors! Some posts may contain affiliate links. ProjectortTop.com is a participant in the Amazon Services LLC Associates Program, an affiliate advertising program designed to provide a means for sites to earn advertising fees by advertising and linking to Amazon.com. How To Hang A Projector Screen From Ceiling? How To Connect Projector To Laptop Without VGA Port?